Hey, cats and kittens, Apple has pushed out an out-of-cycle (ie no one was expecting) iTunes 11 update that brings iTunes Extras for HD movies. Not a revolutionary feature by any stretch of the imagination, but yet another reason to rent or buy movies from Apple. 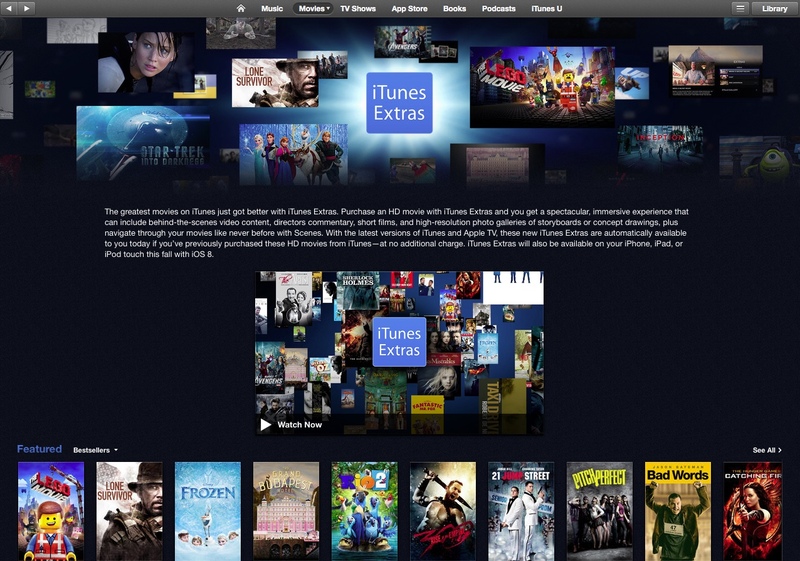 iTunes 11.3 includes all-new iTunes Extras for HD movies. iTunes Extras can include behind-the-scenes videos, short films, high-resolution image galleries, director’s commentary, scenes and more. These immersive iTunes Extras can also be enjoyed on Apple TV with Software Update 6.2 now and will be available on iOS 8 this Fall. The new iTunes Extras will be automatically added to your previously purchased HD movies as they become available at no additional charge, which is pretty cool. iTunes 11.3 is a roughly 140MB patch that add iTunes Extras. There was a time when the iTunes Store was a break even enterprise for Apple. That is, the company sold music, movies, TV shows, etc not to make money directly, but rather so it could sell more Macs, iPhones, iPods and iPads. That was then. Nowadays, the iTunes line item on the company’s earning report dwarfs iPod revenue by a factor of 10.